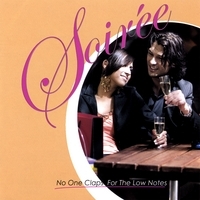 One of the year’s most delightfully charming surprises in the jazz field is the wonderfully titled No One Claps for the Low Notes by the Soiree Band. Based in Pittsburgh, Pennsylvania, the Soiree Band is Big Band jazz with a powerhouse vocalist,Christina Cataldo, who has a sweetly intoxicating voice that leads, rather than follows, the army of instrumentalists surrounding her. Drummer Reid Hoyson spoke to Midnight Jazz about this special unit. Vivian Fields: Your vocalist, Christina Cataldo, has a strong, soulful voice that seems to have stepped right out of the ’40s. How did you find her? Reid Hoyson: I had been looking for a singer for a while and she was referred to me by another singer in the Pittsburgh area. Christina at the time had just graduated from Point Park University in Pittsburgh, as a music theater major. Maureen Budway, who suggested I contact her, is a very good singer as well, and said that she was ” the real deal.” So I couldn’t wait to hear her sing, and when I did I just loved her. She is young but can sing any style with ease. Unfortunately for the band, she moved back to New York to try theater performance. She is only in her 20s so I expect we will be hearing about her. Fields: Just how big is the Soiree Band? How many members in all? Hoyson: The new CD has two sections, the larger big band and then material with rhythm and five horns and a vocalist. The group started as a trio with myself on drums, Bruce Wallace on bass and Victor Garzotto on piano. We brought in various guests to play on our first CD, Soiree. That was in 1998. We now have added Ray Defade, Sr. on sax and flute, who also does a great job of arranging for the band. He is definitely an important part of this whole organization. I had always wanted to do a big band project, and I knew Ray could do the writing. “Soul Searchin'” is an original of his. Fields: When the Soiree Band performs live, do you have this large ensemble? Hoyson: We usually can get away with seven pieces. Every once in a while we can add two more horns and go out with nine people. But for the most part we use two horns, trumpet and sax and rhythm with guitar also. It is really hard to find clients to pay for that many musicians. In the jazz clubs, of which there are not many in Pittsburgh, we can go with only five pieces. We do private functions as well and play all kinds of music, as you can hear on the CD. But whatever we do, the arrangement are good, the tunes are good, and we always leave plenty of room for improvisation. We all have strong jazz backgrounds, so that is important to all. But I still think you can go out and do a private function and play some great music for people, even if it isn’t a jazz gig. Fields: How did the group get together? Audible Images in Pittsburgh. I waited for a year for the completion of the studio, but I think you will agree it was worth the wait. They have a great facility and are producing Grammy winners every year. Fields: When did you first become interested in jazz? Who or what provided the inspiration?